This enchanted collection by Max and Me cocoons the whole body in a feeling of high vibration energy. Begin with Purity and Grace Facial Cleansing Oil to cleanse the skin in the gentlest way. Next, lend a nourished feel to skin with Enchanted Face Oil, a rare blend of argan, marula, wild rose, pomegranate and evening primrose oils scented with notes of jasmine, ylang-ylang, champaca, frangipani, wild mountain lavender and rose. 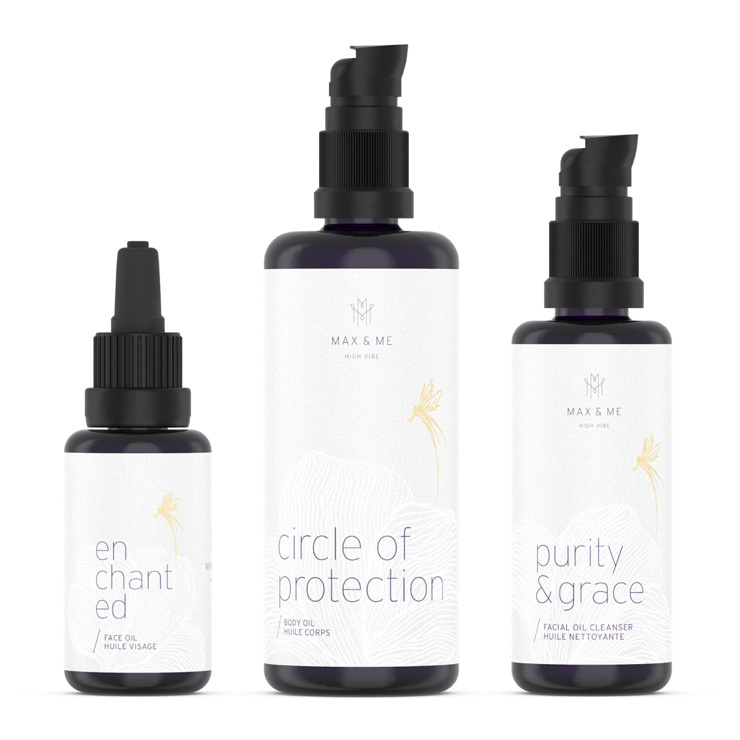 Finally, wrap yourself in a Circle of Protection, a precious blend of moisturizing beauty oils (argan, marula, rosehip) that impart a protective quality to skin and aura. This collection is a value, saving you $20 when purchasing each item separately. • Purity & Grace Facial Cleansing Oil: Massage the facial cleansing oil morning and evening into your dry skin in a circular motion – if preferred repeat the massage movements softly with moist fingertips. Afterwards remove the oil with moistened cloth using soft circular motions. This helps to gently create a smooth feeling texture, stimulate a look of glowing skin, and sets the stage for your facial oil. • Enchanted Face Oil: Warm a few drops of the face oil in the palms of your hands and inhale deeply, connecting with the special energy. Then put the palms of your hands on your right and left cheek and feel the wonderful heartwarming energy of “enchanted” flow onto your face. Pat an extra drop gently around your eye and mouth area to softening the appearance of lines.